Greetings everyone! We pray that this letter finds you in good health and passionate about Jesus! We are excited for what God is doing here in our family, the church, short-term missions, and in the youth. Lots has happened lately in the lives of Rebecka and Emma. 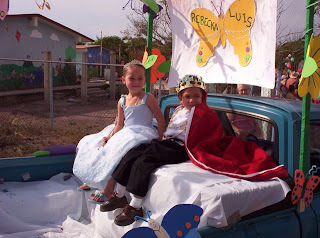 Rebecka and her cousin Luis were King and Queen of the Butterflies for the Kindergarden’s Spring Parade in March. They got to dress up along with the other seven Kindergarden King’s and Queens. As we drove around Cofradía with them in the back of the truck, crowds came out of their homes to receive the candy the kids were throwing. They had a great time. In April, Rebecka participated in a “field day” running a 50-yard dash. She did a great job! Emma Rose turned one year old on April 10th! WOW! Time is flying. She has started to walk all over the place. She keeps us busy and is loads of fun! We also had the wonderful privilege of having some of my cousins take time out of their vacation in Puerto Vallarta and stay with us in Cofradía for a night. That was one of the biggest blessings we could receive, have family and friends come visit us! Please let us know if you’re going to be in the area (Mazatlán, Puerto Vallarta, or Guadalajara) sometime so we can see you when you’re visiting Mexico. We are always honored to have you! The local church here has been growing a lot. We continue to have a number of Family Groups that meet weekly and various other activites that people are involved in, in order to build community and have fellowship. The local Pastor, Gollo Hernández, started to preach on the radio in January once a week for ½ an hour. This radio program can be listened to all over the world through the internet. Locally, the vision is to be able to use it to reach the Indian villages high up in the mountains where we don’t have regular contact. We have had a number of short-term mission teams come down to help us with the mission these past few months. In February, a team came down to work specifically on the new church facility and they were able to finish a couple rooms and the platform. The next team came in March to work specifically with our youth and did a great job. We had a one-day Amazing Race for them to work together with our students figuring out the notes that were written in a mixture of Spanish and English…that was lots of fun! For their work project they started and finished the sanctuary/basketball court floor. Another team came to work with the Children and it was the first time that Rebecka was able to participate, she had loads of fun. For their work project, they were able to start the foundations of many of the classrooms and pour the floor for the library. We are excited for the progress. If you feel led to help by bringing a team or sending donations, contact us. There has been a few students “stepping to the plate” lately in our Student Ministry. They have been involved in Bible studies, skits, musical bands, and preaching. One of the neatest things I get to experience is the one-on-one time with some of the students. We’ve started to pair off at our Friday night meetings for prayer at the end and it’s a great chance to get to know the students more and hear their needs. Also, a number of them come to my office for “mentor time.” I’m encouraged by what God has been doing in their lives! Please continue to look at our blog from time to time, we try to update it weekly. Sometimes I’ll post testimonies of students and write in more detail of how God is impacting their lives. AND PLEASE CONTINUE TO PRAY. · You can also donate online by clicking on "Donate to the Silbermans" to the right of this message. In Prayer that brings Revival by David Yonggi Cho, he says something that really helped me about hearing the voice of God. “It’s not that God is not speaking to us, it’s that we’re not listening to Him.” WOW! I hope this encourages you too!